If there’s been a universal symbol of the earthquake that devastated Christchurch on February 22 – the worst quake New Zealand had seen in 80 years, and the second major quake to hit the Garden City in just seven months – it’s the collapsed spire of the city’s iconic cathedral. For the first few days after the collapse, the cathedral was the site of rescue efforts, as up to 22 people were believed buried under the rubble of the gothic tower. It prompted a rare moment of relief last weekend, as rescuers found those reports thankfully proved incorrect. Now, rebuilding the cathedral will be a key part of the city’s overall rebuilding effort, a process that will take years. As the city’s name implies, Christchurch was in many ways built around that cathedral. The building’s construction began just a few years after the modern city’s 1840s settlement, and the adjacent Cathedral Square became both the center of its downtown street grid and the city’s main gathering place. I’ve taken several trips to Christchurch, and part of its appeal has always been its historic charm. 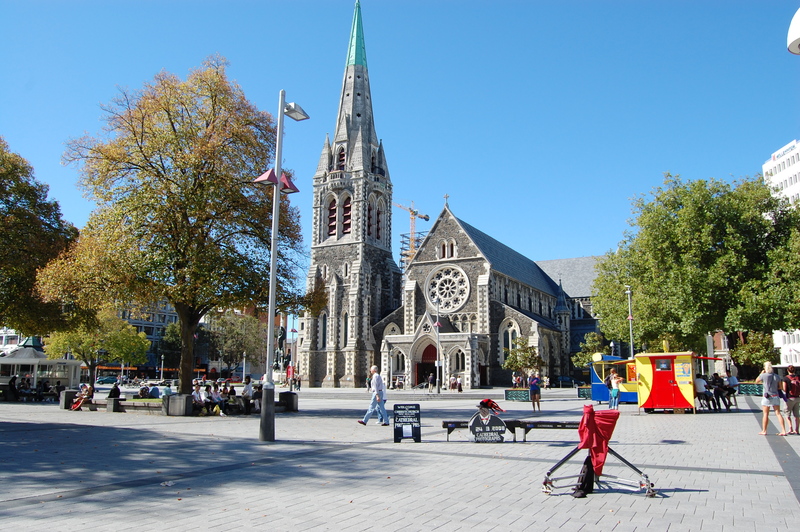 While easily the biggest city on New Zealand’s South Island (and the second-biggest in the country), Christchurch also had a relaxed, almost pastoral aspect. Where Auckland is the sleek and modern business center, and Wellington the cosmopolitan capital, downtown Christchurch still felt in many ways like a modern take on a quaint English town. The shallow Avon River flows through the city center, with willows along its banks and couples taking leisurely rides on small punt boats on warm days. Tram tracks wind through much of downtown, carrying the city’s array of historic trolleys to key attractions. Many of the city’s institutions – the University of Canterbury, the arts center with its dozens of local shops, the regional museum with its impressive collections on Antarctic exploration or early Maori settlement – are still housed in gorgeous stone buildings from the late 1800s. The city’s botanic gardens, its arched memorial for the two World Wars, and its sleek new art museum are all short walks from the central Square. Every visit I’ve made to Christchurch also involved spending some time just enjoying Cathedral Square. The plaza that spread before the Anglican church itself was always a hub of activity. There were usually people playing chess with oversized pieces on an oversized board, or lying out in the sun. On weekends, the Square would host crowded markets, with talented craftsmen selling whalebone carvings, paua-shell jewelry and creative ceramics. In the early afternoon, there was usually the chance to see the Wizard, the robed speaker whose public rants long ago made him a local (and national) institution. Of course, lunchtime usually meant dozens of people lined up at food carts or reading on the Square’s idyllic lawn. Quite rightly, the days after the quake were dominated by rescue efforts, as crews bravely searched for survivors among the wreckage. Now, city and country officials are starting to discuss how to rebuild, and it’s unclear how Christchurch’s downtown will change in the next few years. Some of the historic buildings sustained heavy damage, and a few landmarks will have to be torn down. Many of the taller modern structures collapsed, while others were already in disrepair from the bigger, but less-damaging, September 2010 quake. The city’s AMI Stadium, scheduled to host several matches for the Rugby World Cup starting next September, might not be ready in time for an event New Zealand has long anticipated. Up to 30 percent of the city’s buildings might be too compromised to save. And there’s the open question of whether, in light of February’s horrific events, residents can ever fully regain the earlier pace of life. Many residents have moved away, possibly for the long term. The famous Wizard has even said he’s leaving, as he doesn’t think the city will ever be the same. No doubt Christchurch will be a different place going forward, but there’s no reason to doubt it will regain its place among New Zealand’s most beautiful and welcoming cities. The hope is that the cathedral, long the predominant symbol of Christchurch history, soon becomes a symbol of its rebirth.